Export WordPress posts to CSV file format easily. Configure data order. Simple plugin which exports any default and custom post types from your WordPress website to a CSV file. Perfect solution for those who have no time for a bunch of settings: install, configure, choose what you want to export, and get the CSV. Save your time and get important WordPress data in seconds! We are constantly update the existing translations and add new to the list. If you would like to create your own language pack or update the existing one, you can send the text of PO and MO files to BestWebSoft and we’ll add it to the plugin. You can download the latest version of the program for work with PO and MO files Poedit. * NEW : Ability to delete HTML tags from the CSV file has been added. * Update : All functionality was updated for wordpress 5.0. * NEW : An ability to add post date, author, content and custom fields into the exported CSV file. * Bugfix : Options removal from the database when working on a multisite network has been fixed. * Budfix : The bug with csv file creation when selecting “permalink” field was fixed. * Update : BWS plugins section is updated. * Update : We updated all functionality for wordpress 4.5. * Bugfix : The bug with plugin menu duplicating was fixed. * Update : Textdomain was changed. * New : We added the ability to select several Post status. * New : We added “All” checkbox for convenience. * Update : We updated all functionality for wordpress 4.2.1. * Update : We updated all functionality for wordpress 4.1.1. * Update : We updated all functionality for wordpress 4.1. * Update : We updated all functionality for wordpress 4.0-beta3. * Bugfix : Security Exploit was fixed. * New : The Ukrainian language file is added to the plugin. 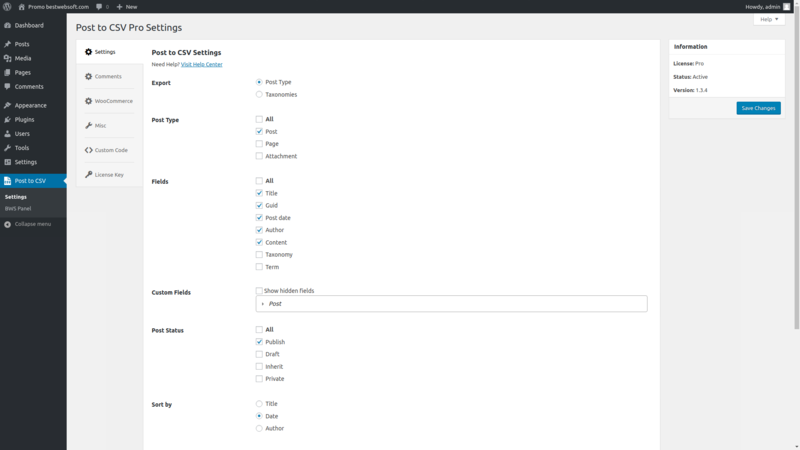 * Update : We updated all functionality for wordpress 3.9.1. * Bugfix : Plugin optimization is done. * NEW: The ability to select the fields to be sorted and the order direction were added.